Stock photo of the clock tower at the Old City Hall Building with modern buildings and blue sky in the background. 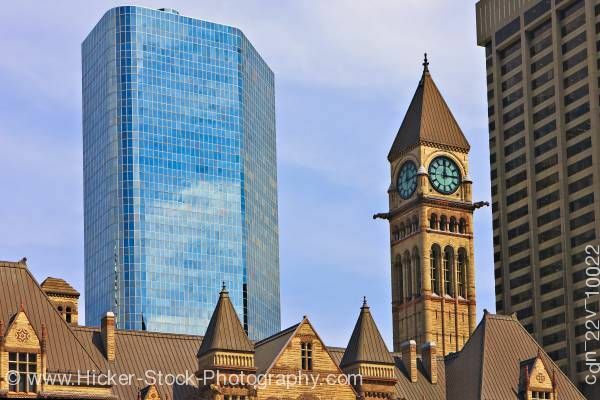 This stock photo includes the clock tower of the old City Hall building in downtown Toronto, Ontario, Canada against a blue and white striped sky. The rooftops of the old City Hall fill the foreground with the green face of the clock in its sandy and brown stone tower rising up above on the right. A taller modern stone building fills the space to the right of the clock tower, and behind old City Hall stands a modern geometric mirrored skyscraper reflecting the light.